Attention: devoted subway train enthusiasts! TTC history buffs! 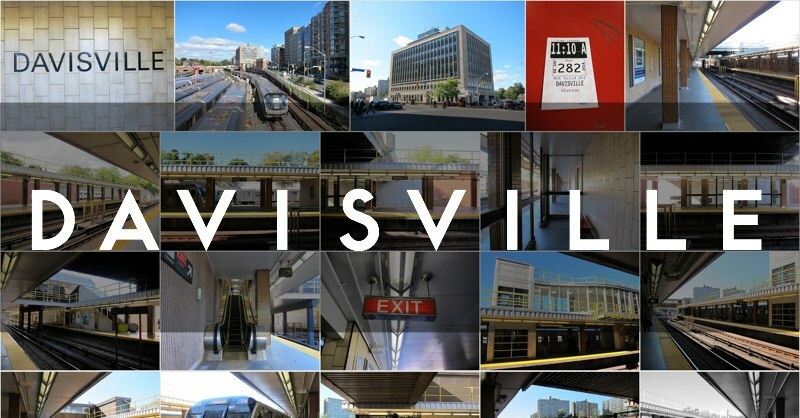 Indulge yourself with a visit to Davisville station, an important stop on the Yonge Subway, with a rich transit legacy to explore. is to the left; above the station stands the McBrien Building. This station is where the opening ceremonies for Canada’s first subway line were held, on March 30, 1954. Over 5,000 spectators were estimated to have attended. Not long afterwards, the TTC built its head office above the station (the structure is named the William McBrien Building, in dedication to the steadfast TTC Chairman who championed the Yonge Subway’s construction. Alas, its glory days are long past; recently CEO Andy Byford called the McBrien Building a “Stygian hellhole”). Davisville is where the TTC situated its first subway yard, a busy complex that continues to service trains to this day. is used by trains entering or leaving the Yard. Railfans will enjoy watching trains shuttling in and out of Davisville Yard. Maintenance work-trains are also often on display. A prime viewing spot for this activity is from the Kay Gardner Beltline overpass, south of the station. If you have a small child accompanying you on the bridge, the conductors will occasionally sound their horn if you wave nicely to them. When the TTC was determining where to place the yard in the late 1940’s, residents of Oriole Park feared a revival of the Belt Line railway, and objected to the secretive, almost conspiratorial process by which the TTC was making its decision. In the end, the residents’ NIMBY concerns were mostly addressed by means of some landscaping architecture, and by reconfiguring the yard to its present north-south alignment. This alignment displaced—at considerable financial cost—the Alexander Muir Memorial Gardens, to their current location south of Lawrence. Take a close-up look at this lovely signal, at the south end. Above the station’s main stairwell from the street, a pair of historical photographs allude to the past (browse the gallery for a peek). As well, the lobby to the McBrien Building features a commemorative plaque and photographs of every past TTC Chairperson. The station takes its name from the village of Davisville, which itself was named for John Davis, an English potter. Starting in 1845, his thriving and expansive pottery—near the present day Yonge and Davisville—formed the commercial anchor of the incorporated village. Davis also served as the area’s first postmaster, and founded the Davisville Methodist Church. I wonder what he’d think of the station that bears his name? Bonus video: The sudden view of Mt. Pleasant cemetery, when the train emerges from the tunnel on the approach to Davisville, is one of our transit system’s minor pleasures.